The East Gulf Coastal Plain is the largest of Alabama’s 5 physiographic regions, or provinces. It is comparatively flatter and less rocky than the other four regions occur north and east of a division known as the fall line. Pitcher plants are the most noticeable plants in our bog, their tall brightly colored leaves open towards the sky, inviting passing bugs to come inside. Our other carnivores are somewhat less conspicuous, they include sundews, butterworts, bladderworts and the Venus fly traps all of which trap and digest insects and small animals to compensate for the low nutrient soils in their wet sandy habitats. Nowhere else in the world except the southeastern US can you find so many different carnivorous plant genera sharing a habitat. The bog is also overflowing with other types of plant diversity. You can find several species of milkworts, orchids, grasses, beakrushes, and mosses accented by blazing star, sunflowers, Barbara’s buttons, meadow beauty, and more. This species once dominated The Coastal Plain from Texas to Virginia. Unique to Georgia and Alabama are populations that grow north of the Coastal Plain. 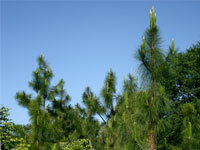 Now there may be less than 3% of the long leaf pine’s original habitat remaining, and only a sliver of that has not been cut in the recent past. The suppression of fire has altered this habitat significantly. Under our long leaf pines can be found an understory of grasses, dwarf oaks and blueberries, but these only represent some of the diversity that grows well with Alabama’s state tree. 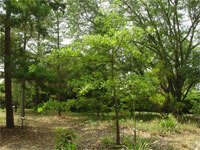 These trees can be found in a diversity of Alabama habitats. They grow in extremely shallow dry rocky soils further north, but south of the fall line they can be found growing in deep sandy soils in places that can be very wet during some part of the year. Dunes are vegetated sand ridges that form along sandy coasts where the forces of waves and wind are relatively strong, such as the northern coast of the Gulf of Mexico in Alabama, Mississippi, and Florida. Plants allow dunes to increase in height and width. Sea oats and other adapted species colonize the area continuing the process of dune formation by trapping more sand and stabilizing it with dense root systems. The dunes provide a buffer to protect inland areas from wave damage, saltwater intrusion and strong winds. The maritime hammock establishes itself on inland dunes stable enough to support the growth of trees. The plants that reside here must endure salt spray carried by nearly constant winds, as well as quick draining soils. This results in more dwarfed growth patterns closer to the sea. There are many oak species that occur in a variety of microhabitats created in sandy soils as you move inland. 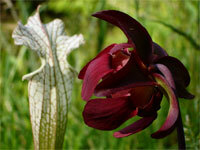 The Coastal Plain includes a plant community growing on dark rich soil called the Black Belt. It forms a wide arc from northeast Mississippi through the middle of Alabama, and then scatters into Georgia. The weathering of Selma chalk below the region contributes to alkaline soil conditions more typical of parts of the western United States. 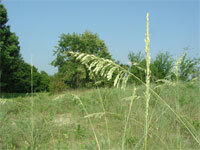 The resulting prairie habitats are unlike anywhere else in Alabama. Many species of wildflowers and grasses fill the treeless spaces.